The simple design of this flared mini dress ensures its versatility. Dress it up with scarves and jewelry. Wear it with your favorite jacket or vest. The possibilities are limitless. 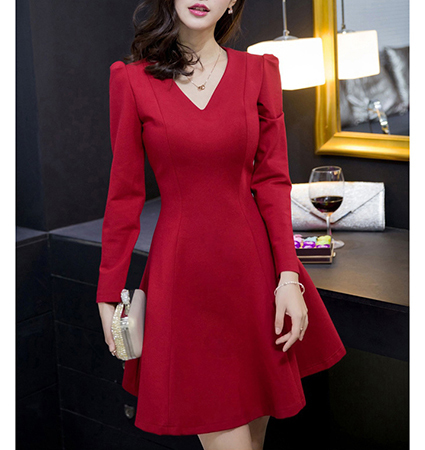 You will love the expertly fitted bodice of this pretty red dress. It has a round neckline and three quarter length sleeves that are slightly puffed at the shoulders. The dress is fitted through the torso and flares out beautifully in the skirt portion. The hemline ends well above the knees. The dress closes with a long, concealed zipper that lies perfectly flat. It is a machine washable dress that may be tumbled dry. It is available for purchase in sizes Small, Medium and Large.